Sprout Social is happy to announce that our mobile experience just got better: push notifications are here for both Android and iOS mobile devices! 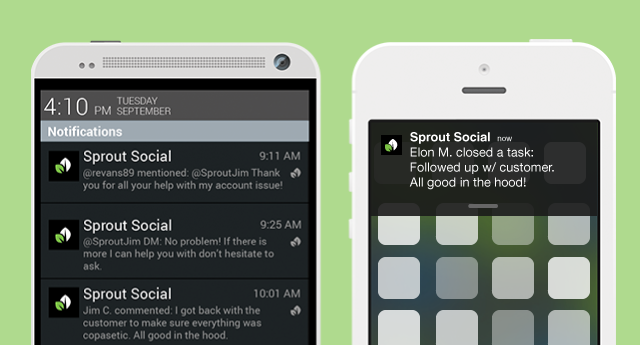 Now, you can stay updated when you’re on-the-go without being in the Sprout app. Always on the quest to make social communications even easier, we hope that push notifications simplify your day-to-day. By providing you with updates of what’s going on in your social channels and the Sprout app, you can easily stay informed and involved no matter where you are. This little dialogue between you and the Sprout app will keep you engaged and updated. We filter through the noise and send notifications for what matters most to your business and brand: @mentions and direct messages. 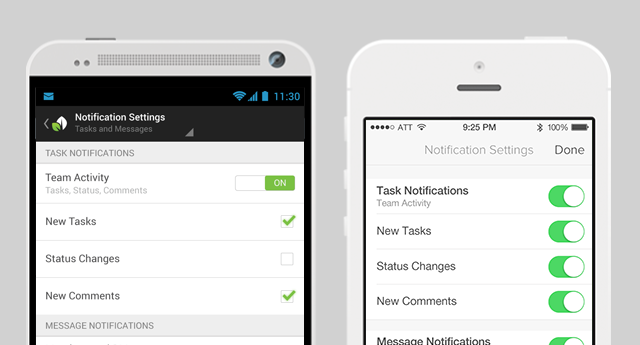 Make sure you get the latest progress updates on your task activities (comments, assigned to, or closed). You are able to set up push notifications to suit your own needs; simply turn the notifications on and select which updates to receive. Additionally, you will continue to receive emailed task notifications at the discretion of your Sprout account owner—so you’ll always be in the know. Any questions about the update? Tweet us and let us know what you think!